Photo courtesy of Ben Barrett, who was once Supply Sergeant in A Battery, 22nd Coast Artillery, before being assigned to the JMP Arnold in late 1941. He was not aboard the Arnold when it sank. He later served on the Greeley before shipping out to join the paratrooper divisions in Europe. The U.S. Army Junior Mine Planter (USJMP) Lt. Col. M.N. 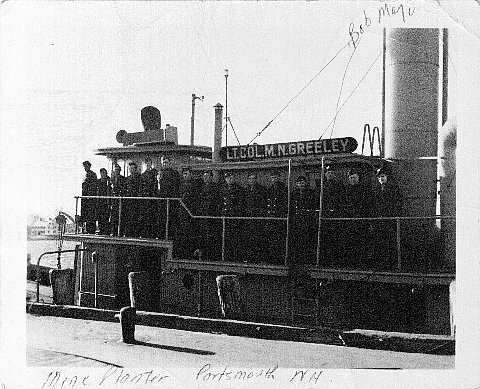 Greeley, at dock at the Fort Constitution wharf sometime in late 1942. This boat had replaced the JMP General Richard Arnold after it had sank with all hands in January 1942.